Cheesy Pizza Casserole is an easy 30-minute meal loaded with cheese, cheese, & more cheese. This is the best recipe to celebrate National Cheese Day. Thank you to Farm Rich for collaborating with me on this post, all opinions expressed our my own. Today, I am collaborating with Farm Rich to bring you this awesome drool-worthy Cheesy Pizza Casserole. And be sure to check out some more delicious cheesy recipes at the bottom of my post. All simple, easy and delicious recipes using Farm Rich Mozzarella Sticks. My kids love pizza night in our house, which is once a week. From homemade to delivery or dine-in, we love pizza. My husband loves just a little cheese on his pizza, just kidding he loves a TON of cheese on his pizza. He might as well order a block of melted cheese with a side of pizza crust. And my kids must have received that cheese-lovin’ gene from him which is what inspired this Cheesy Pizza Casserole. I used Farm Rich Mozzarella Cheese Sticks and layered them with pizza sauce, cheese and toppings making this an instant hit in our home. The first time I made it my kids didn’t speak to me, then after about 15-seconds of peace and quiet, the silence was interrupted with applause. Jordan leading the clapping, they were impressed with this recipe and they said it was better than pizza. AWESOME. 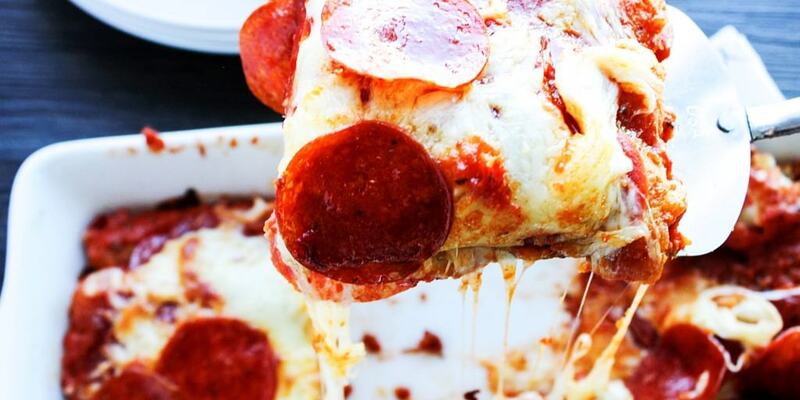 What makes it even more AWESOME is that this recipe for Cheesy Pizza Casserole is easy to make. Assemble it in 5 minutes, bake it for 20 and this casserole is ready to eat in less than 30-minutes. Now, that my friends is the best kind of meal. There is not a better way to celebrate National Cheese Day than with this Cheesy Pizza Casserole. Cheers to easy meals, great recipes and well, cheese. 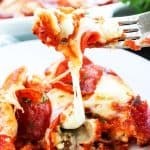 How do you make this Cheesy Pizza Casserole? Spray baking pan with cooking oil, then add a single-layer of Farm Rich Mozzarella Cheese Sticks on the bottom of the pan, as pictured. Top Mozzarella Sticks with pizza sauce and spread evenly. Add pizza toppings, save a few to garnish the top of the pizza with. Sprinkle grated mozzarella cheese over pizza sauce & toppings, add the left over toppings on top of the cheese. Place pan in preheated oven for 20-25 minutes, remove from oven. Serve & devour immediately. Don’t forget to pin this to your favorite Pinterest board to make for later! Sharing is caring, send to your friends and family that would enjoy this recipe as well.